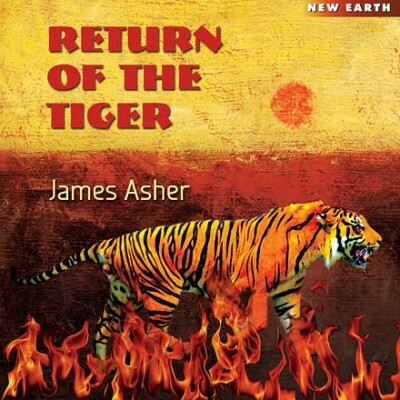 With Return of the Tiger, James Asher harnesses a deep current to create rhythmic soundscapes rich in world beats, ethnic instruments, and global cultural influences. The drumming celebration that started with the groundbreaking album Feet in the Soil continues as Asher returns with this vibrant addition to his world beat repertoire. The great drum master has surpassed himself and managed to surprise us all by exploring musical territory where no one has ventured before, bringing us new sounds and eliciting strong emotions. Credits : Recorded and produced by James Asher at Starfield Studios, Eastbourne, East Sussex, England. ‘Until the Ice Cracks’ and ‘Interdimensional Prayer’ composed by James Asher and David Glendining. ‘Egyptian Ceremony’ and ‘Bells of Freedom’ composed by James Asher and Arthur Hull. All other compositions by James Asher. Creative Direction: Waduda Paradiso and Bhikkhu Schober. Music published by Soundless Sound. Musicians:- James Asher : Keyboards, Drums, Percussion, Acoustic Guitar, Bazouki, Programming.David Glendining – Keyboards,Vision, Animation, Humanity. Arthur Hull – Pentatonic Bells, Congas, Percussion and Playfulness. 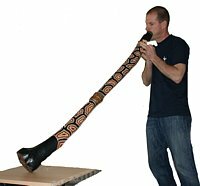 Jason Salmon – Didgeridoo. Sam McEvoy – Percussion. Nimmala : Vocals on ‘Interdimensional Prayer’. Sessalangi Allstars : Vocals on ‘Salute to Cuba’. My thanks go to the musicians and the two co-writers on this project. Thanks to Soundscape for providing an audio recording format which made this fun to record, and Ken Barton and his technical support through the coldest winter to enable me to continue. This album is dedicated to Grahame Gerrard, a great longstanding friend who sadly died on April 7th, 2011. He was a fantastic source of humour and inspiration, and helped me mix most of my albums thus far. He also guided me in selecting technology and how best to apply it. A brilliant mind, a warm and soulful friend and brilliant companion. He is, and will remain greatly missed. Since I moved to Eastbourne from London, I have played drums for a lot of live music. Initially starting with jazz, rock ‘n’ roll, and some Caribbean music, this has progressed on through to blues, ceilidh and boogie woogie music. This doesn’t mean my music has become any of these, but draws on the juice they provide. Playing for an audience is not only about calling on the playing to be in the moment, but is also about the energetic exchange between the musicians and that of the audience. It also lubricates the creative flow which fires the composition process, along with my always favoured source of inspiration – amazing sound selections, of which there is now a huge and ever broadening supply. Musical hardware is getting scarcer, but there are still some great keyboards from the mighty three – Korg, Yamaha and Roland. Virtual instruments continue to grow and get ever more powerful, and in this regard particular credit should go to Eric Persing from Spectrasonics, whose awesome programs Stylus RMX, Omnisphere and Trillian are fabulous working tools and invitations to remain creative. The world has experienced some extraordinary changes during the last year, and as an artist I feel lucky to be able to draw on an expansive range of sounds, textures and different means of creating to express my feeling and response to these changes. Things feel sometimes so precariously balanced, that absorbing and acknowledging the delicacy of how things stand give one a sense of being dwarfed by Nature, who struggles to contend with what has been inflicted upon her. Every so often her loud voice reminds us who really does control the show, and that we are lucky to continue at all, all things considered. My contact with Aura-Soma has greatly helped me maintain and appreciate the value of balance in many ways. A remarkable and excellent resource, and a great supporter to my life and creative process. There is light and dark in the compositions. Until the Ice Cracks was inspired initially by a storyboard idea David Glendining and I were exploring for an animation about a wolf, or Wolfie to give him his full title. Originally, Wolfie was a poem written by David. Within this seem to come the perfect opportunity to voice some deep sense of misgiving as to how cataclysmic world events, and natural disasters seem so relentlessly on the increase. Sometimes the impulse to express an idea is so strong at a subconscious level, it takes the merest brushing over the surface to bring this out. Interdimensional Prayer is based on a Buddhist chant used during funeral ceremonies. The original text she chants can be translated as:- “All conditioned things are transient, their nature is to arise and cease, and in that is found calm and ease.” The recording of Nimmala chanting surfaced two years after her own death, and was made by a friend as she chanted in memory of her father. The ability to maintain steadiness, openness and good will through the reality of the process of one’s own confusions, failures and eventual dissolution is a primary benefit of having a living spiritual practice. In the case of Northpoint, there is a duet between bagpipes and sarangi – the Indian bowed instrument. In the expansive palates and canvasses provide by new technology, this unlikely pairing form a convincing duet and relevance to one another. They both share deep characterfulness of sound, and somehow their dialogue just seemed to pour out effortlessly one morning. In this context, I feel like the observer being lucky to experience and notate their interplay. Being musician must have at times its more mystical side to counteract the more mundane aspects, and joyfully it does. Bhikkhu heard the latest draft of the album in April 2011. When he listened to the energetic and driving quality of Jason Salmon’s didgeridoo on Track 1, he painted a picture in words of what this evoked for him. A chariot pulled by Tigers, with its driver a whip-carrying and ferocious woman. What he described was further inspiring to me and the remixed version which is Track 10 evolved so much it feels like a completely fresh track from the original, hence its different title. Both versions benefit greatly from the skillful and individual percussion style of Sam McEvoy, who has played with me in the ceilidh band Moondance. The new context within which music now finds itself, does place considerable demands on the artist to create music which holds its own on every track. Initially daunted by this it became over time a positive spur to ensure that each composition works in its own right. Bhikkhu, Waduda and I have been friends since the release of Feet in the Soil in 1995. Though we may not always agree on the desirability of every musical idea, our interaction has enabled me to create some of my finest music, and their unique approach, taste, and way of working have facilitated this album, of which I am proud. David Glendining was introduced to me by a mutual friend. Not only did we discover we both owned the same Yamaha keyboard and Cakewalk software, we share a delight in dreaming up dramatic visual scenarios, for which we have mostly so far just created the soundtrack. David’s theatrical and acting skills heighten that perspective for me in a very enjoyable way. 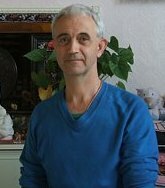 On the visual front David is an animator, and I have enjoyed manipulating and editing video for some time. Our intention is to further explore how far we can evolve these audio-visual ideas. Humour is the key linchpin that makes our co-creating such fun, and many of our working sessions dissolve into hoots of laughter – a great spur to the process. Arthur Hull has been a friend and co-creative partner for some nine years now. Each year whilst in the midst of his international touring schedule he stops off for a week with me, and he enjoys getting his ‘studio tan’. 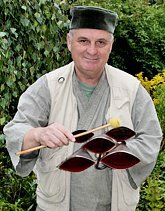 Of course Arthur, as one of the world’s premier drumcircle facilitators and teachers is used to leading a playful exploration of creative fun to be had. Not only that but a great encourager, and master of the A and B sections in how a musical piece evolves. His extensive knowledge of different world rhythms consistently fascinate me, though I fully credit his championing of culturally non-specific drumming. That is to say that playing from your heart is more important than rigidly observing form. In between his getting the world to groove together, we get together and have excellent fun, and in the process evolve some great musical tracks. After our first collaboration – Sounding the Stones, our second album together nears completion. I enjoy bedazzling him with a yet broader range of musical and sound options each time we meet. He also brings on each visit an instrument for us to share. On the last visit he brought these gorgeous sounding perfectly tuned pentatonic bells. See Track 7. Such sweetness, simplicity and joy!